Frugal London sounds very much like an oxymoron... London is one of the most prosperous and expensive cities I have seen in quite some time... Construction cranes are everywhere and there is a vibrancy in the people that reflects the progress that London is making. 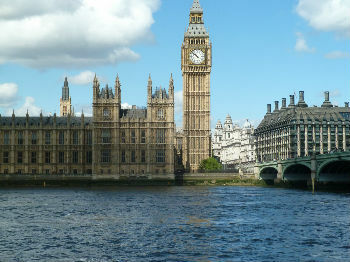 We recently visited London at the end of our usual spring transatlantic cruise... Fort Lauderdale to Southhampton. We took a bus tour from the port of Southhampton that stopped in Stonehenge, the city of Salisbury with its beautiful cathedral, and Windsor Palace... A little pricey but it featured a direct drop off at our hotel. Usually we would look for a train/subway option but we were carrying luggage not only for ourselves but for some friends that we were going to visit in Exeter so the hotel drop-off was a big plus. We chose a hotel that was far enough from the attractions of central London but very close to a tube stop. The London "Tube" is like the New York subway or the Paris/Rome Metro... It can get you anywhere you want to go very quickly and inexpensively when compared to a car or a taxi. The hotel that we chose offered a very nice breakfast, including a real not powdered scrambled eggs... One of the better breakfast values that we have had in a hotel. We used Booking.com To make our reservations for this trip and look for hotels that had free 24-hour cancellation options giving us the maximum flexibility. It helped make frugal London a reality for us. This was our first trip to London and Paris and that flexibility was important to us. 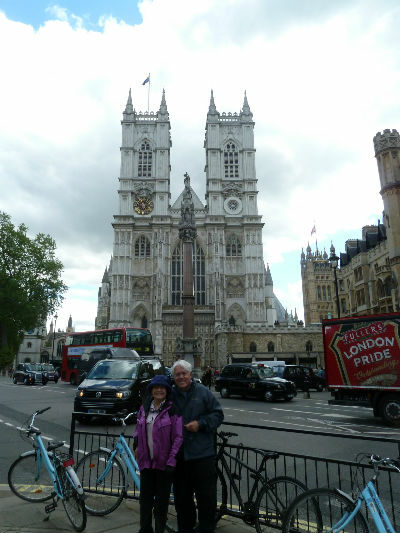 Although we have not been on a bicycle for over 20 years we decided to take a bicycle tour of London and it turned out great... We pedaled for 8 miles, over two bridges, very safely and saw more in that one three-hour tour that would be possible on foot in 3 days. It was cold that day but we were ready for it with waterproof ponchos and coats. This is us in front of Westminster Abbey where the coronations, and Lady Diana's funeral, took place here. Queen Elizabeth is two years from replacing Queen Victoria as England's longest reigning monarch... When she passes her successor, Prince Charles at the present, will have his coronation here. We highly recommend using fat tire bike company for your bicycle tours. We used them once in London and three times in France... Absolutely first-class and it will not be the last time we take a bike tour when you want to see a lot of a new city in a limited amount of time. So frugal London is possible if you look at the best use of your time and cover as much of the attractions that are of interest to you.